Witchcraft medicine is a kind of applied pharmacology of the plants with potent activity. The powers that be have always sought to control the use of strong medicines because, among other reasons, rulers feared they might be poisoned by a skilled hand. In earlier times however, the powerful activity observed in a substance was considered to have its origins in the supernatural, magical, or even in the sorcery of witches. In other words, the potency and effectiveness of a substance were considered proof of witchcraft. Indeed many medical treatments used during antiquity were not based on rational pharmacology, but were a combination of ritual and the use of material substances. Man already believed in archaic times that the plants only revealed their power when harvested with the proper ritual gathering method, and only when the correct accompanying words were spoken.. The ancient authors (such as Homer and, in particular, Diocles) wrote of the rhizotomoki, the root gatherers of archaic times, that they were the inventors of pharmacological medicine and that they still spoke with the plant spirits (Baumann, 1982: 15; Graf, 1996: 69). These root gatherers observed the gods sacred to the respective plant. They made use of the moon’s energy and knew the particular oath formulas for each plant. Witchcraft medicine belongs to the spiritual and cultural legacy of the rhizotomoki. When a scientific theory rationalizing the healing arts emerged with the Hippocratics, ritual and magical medicine was slowly suppressed. It was ridiculed as superstitious and ultimately driven underground. Only certain areas of magical medicine were maintained in the healing cult of Asclepius and were officially accepted into late antiquity (Krug, 1993; cf. Meyer and Mirecki, 1995). Witchcraft medicine is the healing art of the underground. It is the forbidden and despised medicine, the one oppressed by the church and/or state, the kind of medicine sanctioned as “alternative.” For it makes decisions over life and death. And it does more than make people healthy--it brings joy and awareness, inebriation and mystical insight. Witchcraft medicine is wild medicine. It is uncontrollable, it surpasses the ruling order, it is anarchy. It belongs to the wilderness. It scares people. It is one thing above all: heathen. Witchcraft medicine stems from shamanism and has its roots in Paleolithic times. Witchcraft medicine is mythological, ritualistic, and strongly feminine. Witchcraft medicine is religion--a shamanic healing religion revolving around sacred, in other words, effective, plants. Cults, in which the medicinally effective plants and sacred beverages play a role, have always been viewed suspiciously, at first by representatives of the Christian faith, later also by Western medicine. The witches, the last wise women of European culture, fell victim to the Inquisition. In Siberia in the nineteen-thirties and forties shamans were prosecuted as counter-revolutionaries. Today shaman are also denigrated and ridiculed. So there was in the year 1900 that the Protestant church of the Indonesian island Siberut which lies east of Sumatra, released a decree forbidding the activities of the medicine men as heathen and blasphemous (Plotkin, 1994: 187). Thus witchcraft medicine was used to increase happiness, for birth control, to heal, to damn, for visionary knowledge, and for life extension. This is why magic was originally called pharmakeia (Luck, 1990: 58). A typical characteristic of witches’ herbs is their ambivalence--to some they cause damage and disease, to others they offer health and protection. Often they ease the problems they have caused, and they are intoxicating or induce trances. They are true pharmaka--in the ancient meaning of the multidimensional word. For these herbs the wisdom of Paracelsus--that it is only the dosage which determines whether or not something is medicine or poison--holds true. And with witches’ herbs it is extremely important to determine the correct dosage. It is well known that in antiquity the witches’ clients were often poisoned or were made “crazy” by the love potions (amatoria, remedium amoris), which commonly contained the active pharmaka of nightshade, henbane, or hemlock. But because the users did not heed the maker’s instructions out of pure greed, they overdosed. For this reason such substances had already been forbidden by Roman times (Graupner, 1966: 26). The person who, even if it is done without bad intention, provides abortions or love potions, because doing so sets a bad example, will be sentenced to the following punishments: People of lower classes shall be sent to forced labor in the mines, members of higher classes are to be exiled on an island after the seizure of a portion of their possessions. If a man or a woman dies because of the treatment, the death penalty will be implemented.” (Codex lustinianus, Dig. 48, 8; 3, 2/3). Claudia Müller-Ebeling, Ph.D., is an art historian and anthropologist and coauthor, with Christian Rätsch, of Shamanism and Tantra in the Himalayas, Witchcraft Medicine, and Pagan Christmas. She lives in Hamburg, Germany. Christian Rätsch, Ph.D., is a world-renowned anthropologist and ethnopharmacologist who specializes in the shamanic uses of plants. He is the author of Marijuana Medicine and coauthor of Plants of the Gods, Shamanism and Tantra in the Himalayas, Witchcraft Medicine, and The Encyclopedia of Psychoactive Plants. He lives in Hamburg, Germany, and lectures around the world. Wolf-Dieter Storl, Ph.D., is a cultural anthropologist and ethnobotanist who has taught at Kent State University as well as in Vienna, Berne, and Benares. He is coauthor of Witchcraft Medicine and has written a number of books on indigenous culture and ethnobotany. He lives in Allgäu, Germany. "A well-researched and interesting read." "Tracing human relations with plants back to the Stone Age, the book is deeply thorough and rests on interesting scholarship." "It is essential reading for anyone interested in the folklore and magical beliefs asociated with flowers, herbs and trees." "Witchcraft Medicine blends history with practical applications of plant healing and shamanic practices." 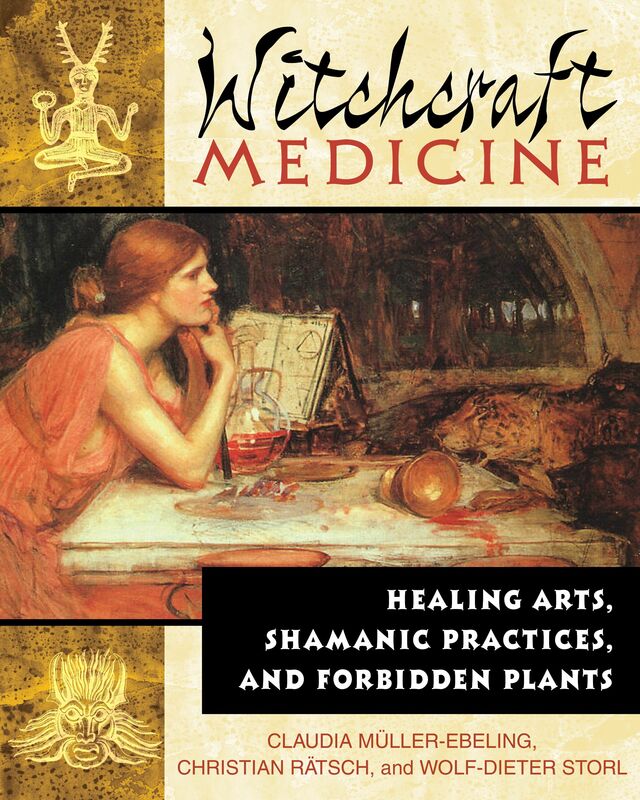 "Witchcraft Medicine is a solid book and an essential research tool for anyone interested in European folk traditions, magic, alchemy, or herbalism."